Review and reputation management company GetFiveStars has changed its branding to GatherUp and added a conversion popup to its already impressive list of features. The name change represents the intention of the company to focus on the full customer experience rather than just gathering good reviews for a business. “Our change to GatherUp brings a new brand to represent our focus of making customer experience a key contributor to business growth. In today’s ‘Amazon economy’ hassle-free shopping and low prices are no longer a competitive edge, they are the new norm. Delivering happiness in a customer’s experience is where a business must win. And we can help them do it. We can help them improve and market their reputation to earn more business. We’re excited to enhance a business’s capabilities to listen to their customers with GatherUp.”, says Aaron Weiche, CEO of GatherUp. Along with the name change, GatherUp has added a new functionality to their platform, which is a conversion popup. 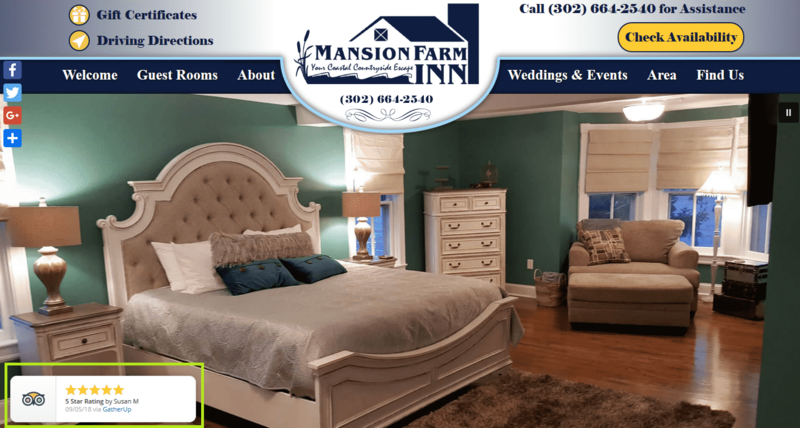 The conversion popup will “fly in” and rotate on an inn’s website, showing your great customer ratings to people visiting your site. You can set the limit of stars that will show to customers, and then manage how your popup displays from the GatherUp business dashboard. Implementation is simple – just adding a bit of code script to the header or footer of your site. The popup can be linked to any page of your website or your booking engine – if you’re using the GatherUp review widget, the potential guest can click through to see even more of your great reviews. GatherUp allows inn owners to followup with their customers after a stay and ask for reviews on several different sites. This makes it easy to gather reviews at a steady pace on various platforms. You can also hear directly from your customer if something wasn’t all that it could have been, and try to mitigate a situation that might have led to a bad review. All of the information and function is accessed via your own personal business dashboard. Acorn customers can save by purchasing GatherUp through us. Rather than $39.95, your cost is only $20 per month (paid as a yearly fee of $240), plus $85 for setup and popup implementation. Contact our Sales manager at 877-226-7699 or sales@acorn-is.com for a bid.